Scottish Justice Matters is a publication of the Scottish Consortium of Crime and Criminal Justice (SCCCJ). The Consortium is an alliance of organisations and individuals committed to better criminal justice policies. It works to stimulate well informed debate and to promote discussion and analysis of new ideas. It seeks a rational, humane, constructive and rights-based approach to questions of justice and crime in Scotland. 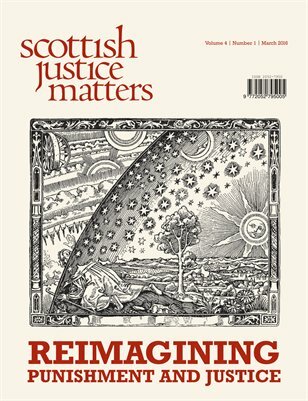 Our theme for this ninth edition of Scottish Justice Matters is reimagining punishment, which can, as our guest editors Bill Munro and Margaret Malloch argue, range from philosophical considerations of Utopias to, in present day Scotland, the use of imaginative projects around reducing the use and rethinking the role of prison.